Are Rancid Fish Oil Supplements Harming My Health? Think about fish oil. If your gut reaction is “yuck,” you are in good company. 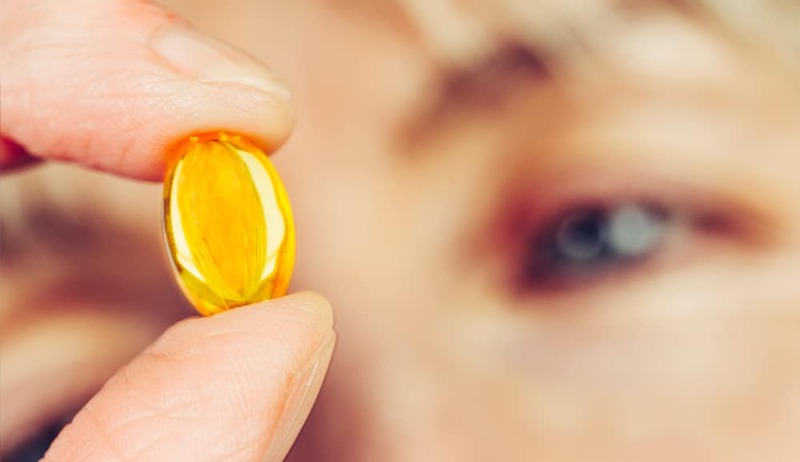 Whether it’s from remembering Grandma’s cod liver oil or taking the foul horse-pills in the cupboard, the majority of us believe that fish oil ought to taste bad. We put up with the unpleasant taste and awful fish oil smell because, well, it’s hard to argue with the health benefits substantiated in thousands of research studies. But the truth is that omega-3 supplements shouldn’t taste like yesteryear’s salmon. If your omega-3 supplement smells fishy or gives you nauseating fishy burps all day, you most likely have a rancid product on your hands. If you eat fish regularly, you probably know that fish spoils more easily than other foods if not kept cold or consumed quickly. The same goes for fish oil. The reason fish and fish oil spoil quickly – or ‘oxidize’, as the scientific community calls it – is that they are rich sources of the omega-3 fatty acids EPA and DHA. EPA and DHA are the main workhorses of the omega-3 family. The are known for their anti-inflammatory properties and role in promoting good brain health, to name just a few benefits. But their chemical structure also makes them highly prone to oxidation. If the EPA and DHA molecules become oxidized, their molecular structure starts to change and the molecules break down into byproducts. These byproducts, known as lipid peroxides, give off the unpleasant smell and taste of spoiled fish. How quickly the omega-3 molecules oxidize depends on a number of factors. For instance, the oxidization process typically begins as soon as the fish gets caught, but it can be checked depending on the speed of harvesting the fish and the temperature. How the fish oil is processed and distributed also makes a difference. The more you can reduce the oil’s exposure to oxygen, heat and light, the better. And adding antioxidants to the oil can also help. But, if the oil has already started the oxidation process, there is no going back. At that point, it is just a matter of time before the oil turns rancid. Rancidity is something you can taste and smell, so to assess the freshness of an omega-3 oil, put it to the taste and smell test. In this video, a tasting panel compares Omega Cure® cod liver oil with a krill oil, prenatal omega-3 supplement, and fish oil capsule. See how they fare and try it at home with your supplement. 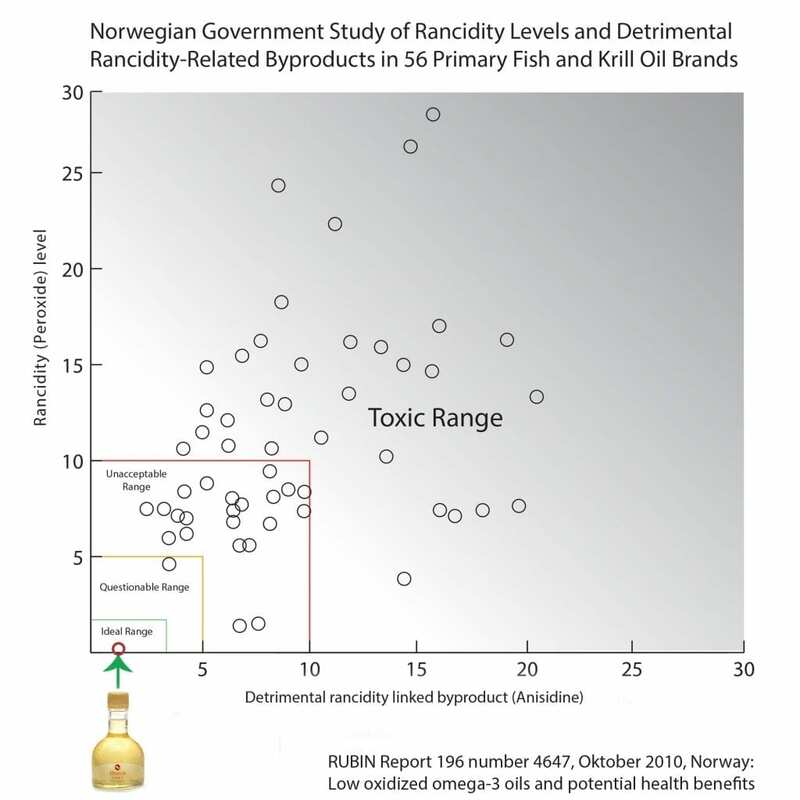 Aside from tasting and smelling bad, rancid fish oil is a big problem. First and foremost, rancid fish oil is less effective than fresh fish oil — much like eating fresh fruits and vegetables has more nutritional value than eating fruits and vegetables that have been stored for months. As mentioned above, as EPA and DHA molecules oxidize, their chemical structure starts to change. If the molecules don’t have the same characteristics as their unoxidized fatty acid counterparts, it is likely they will not be able to perform the same beneficial functions in the cells. Furthermore, scientists believe that consuming rancid fish oil could be harmful. Instead of providing heart protection, oxidized oils may actually increase the rate of atherosclerosis (buildup of plaque in the arteries). In animal studies, oxidized fatty acids have been found to cause organ damage and inflammation, among other problems. In addition, researchers have speculated that consuming oxidized oil may cause carcinogenesis. In the last three years, two studies comparing unoxidized and oxidized oil has added more damning evidence. These studies concluded that consuming oxidized oil had a negative effect on cholesterol levels and could be linked with Alzheimer’s disease, while the unoxidized oil provided the expected health benefits. In other words, for the sake of your health, it’s important to consider the freshness level of your omega-3 supplement. Especially given that studies from Canada, New Zealand, Norway and other nations have all found that far too many omega-3 supplements exceed acceptable oxidation limits. 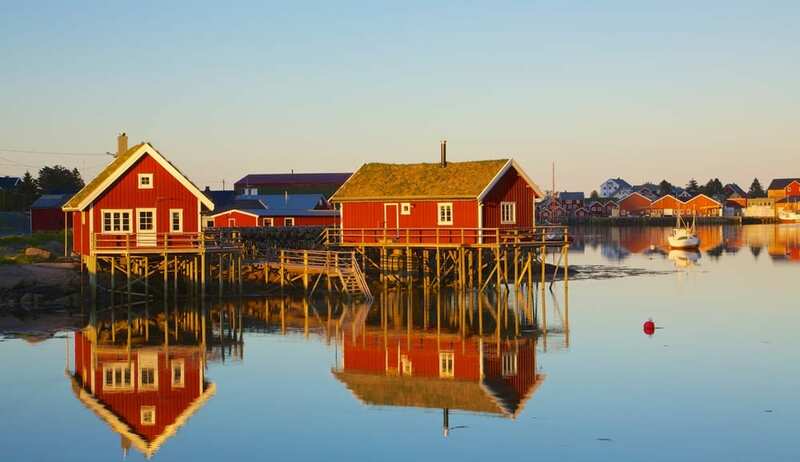 Several countries have evaluated the freshness levels of different omega-3 supplements on the market and found that the majority of products are rancid at the time of purchase. The numbers here are taken from one Norwegian study, which included Omega Cure. While rancid fish oil is unfortunately all too common, fresh fish oil can provide consumers with a relatively inexpensive, safe way to improve health. Some of the most commonly cited benefits of getting enough omega-3 includes: lowering triglyceride levels and blood pressure, facilitating recovery from traumatic brain injury and stroke, and improving focus and mental health. Step 1: Evaluate your current product. The best way to tell whether or not your omega-3 supplement is fresh is to put it through the taste and smell test. If you have capsules, break them open. If your nose gets a whiff of a strong fishy smell, then throw your capsules away and get something else. Step 2: Make smart purchases. Fish oil is a food substance that is highly perishable, just like milk or seafood. To a certain degree it can be stabilized, but beware of labels that have a two to three year expiration date. These products have likely been sitting on the shelf for years before they even hit the supermarket, and almost certainly contain rancid oil. 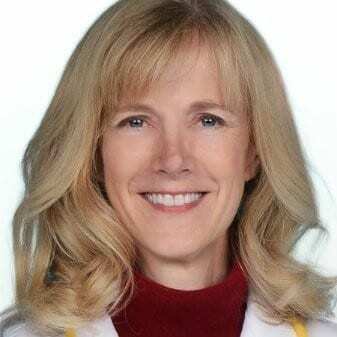 Another good idea is to ask manufacturers to share their fish oil’s oxidation numbers, better known as the peroxide, anisidine, and TOTOX values. These values will give you a good picture of you oil’s freshness level. Remember, the lower these numbers are, the better. Step 3: Remember that bigger is not always better. 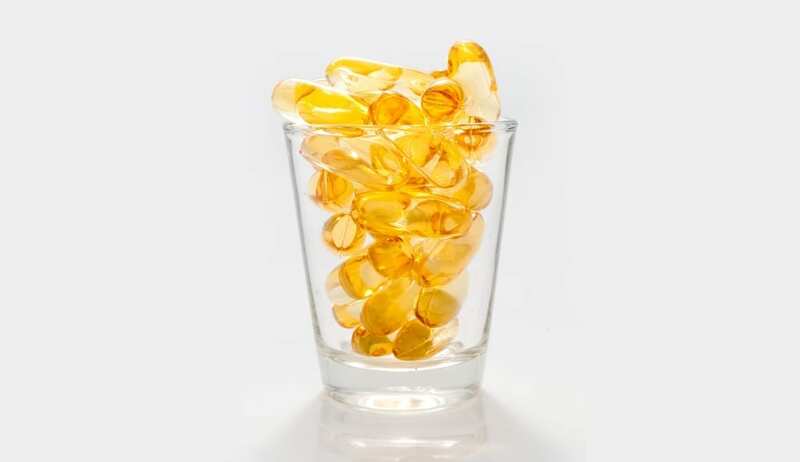 Look for small containers, not supersized bottles, when buying fish oil. The longer a fish oil is stored, even in gelatin capsules, the greater the chance it will becomes rancid over time. Step 4: Keep it cold. Buy fish oil that you can store in the freezer or refrigerator. Low temperatures slow down the enzymatic time bomb that is ticking away. Step 5: Use it or lose it. When you first buy fish oil, don’t let it sit around. Use it up within a few weeks. Too often, people hoard old capsules or bottles of oil, thinking they are saving money. But remember, you wouldn’t save a fillet of fresh fish in the refrigerator, hoping to get a great meal out of it weeks or months later. Think of fish oil supplements the same way, and throw old products out. Often, marketers will focus on ‘purity’ as the major indicator of how to evaluate the quality of fish oil. By purity, the manufacturers are talking about the low levels of toxins, like mercury, in the oil – although for the consumer, purity by association conjures up an impression of freshness. Low toxicity levels is certainly important, whether we are talking about eating fish or taking fish oil supplements. With all of the pollutants in the water, we don’t always know what we are putting in our mouths. Fortunately, most respectable fish oil manufacturers today purify their oil and provide a certificate of analysis that shows the levels of toxins and heavy metals in the oil. However, the “purity” of a product says nothing about the freshness of the oil. These are separate quality measurements. At Omega3 Innovations, quality and freshness is the foundation of all our products. We are dedicated to manufacturing omega-3 fish oil that has a fraction the oxidation level of most other omega-3 supplements. And we are transparent about those oxidation numbers, listing the oil’s peroxide and anisidine values, as well as the date of bottling, on every product. To learn more about how our oil is made, visit Omega3 Innovations’ About Our Oil page. here in India, we have good reviews of Nature’s bounty fish oil. Do you think they are up to standards in maintaining the quality of oil (logevity) until ,the expiry date. Hi, I am a resident in the uk and have been looking for a good quality fish oil for years. Most of them that are actually available in the uk are no good and in no way even comparable to your quality. However, you do not currently deliver to the uk, nor can I find your product elsewhere. When can you expect to deliver to the uk? Many Thanks! We are happy you took the time to write to us. We’re expecting to be able to deliver to the UK by the fall of 2016 with our Omega Cure Extra Strength vials. If you stay posted on our website and social media pages, we will be spreading the word as soon as it is available.